Health beneficial effects of repeated mild stress of choice…. The consequences of stress can be both harmful and beneficial depending on the intensity, duration and frequency of the stress, and on the price paid in terms of energy utilisation and other metabolic disturbances. But the most important aspect of stress response (SR) is that it is not monotonic with respect to the dose of the stressor. Rather it is almost always characterized by a nonlinear biphasic relationship. Several meta-analyses performed on a large number of papers published in the fields of toxicology, pharmacology, medicine, and radiation biology have led to the conclusion that the most fundamental shape of the dose response is neither threshold nor linear, but is U- or inverted U-shaped, depending on the endpoint being measured. This phenomenon of biphasic dose response is termed as hormesis, and I suggest HORMETICS as the term to refer to the science and the study of hormesis. The homeodynamic ability of a biological system is affected by stress in a biphasic dose response manner, termed physiological hormesis. 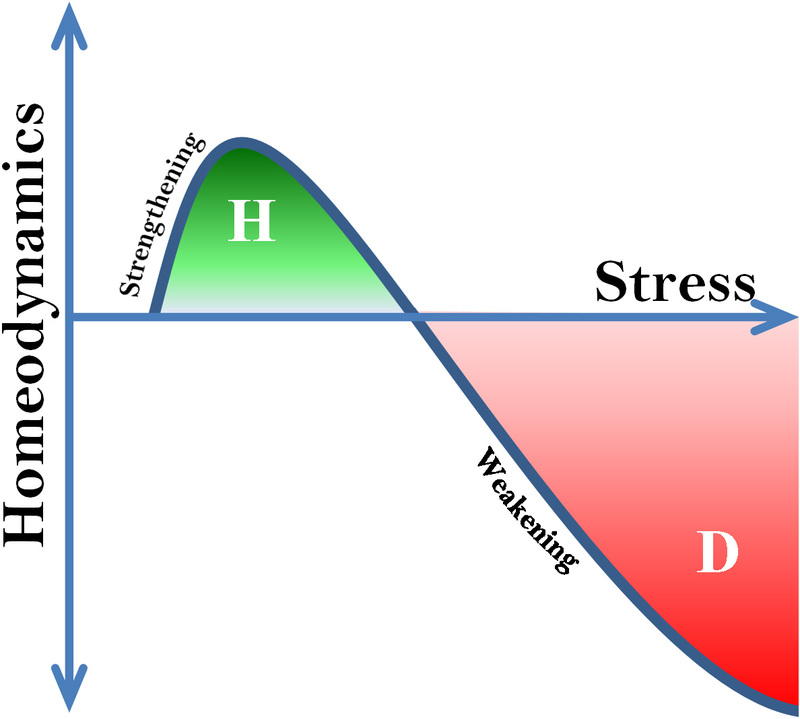 Lower levels of stress result in the strengthening of homeodynamics in a hormetic zone (H), and a chronic and severe stress results in the weakening and disruption (D) of the homeodynamics leading to functional impairments, diseases and eventual death. The key conceptual features of hormesis are the disruption of homeodynamics, the modest overcompensation, and the reestablishment of homeodynamics. – Nutritional hormetins – food restriction (fasting, low calorie diet), spices (turmeric, clove), zinger, garlic, onion, and micronutrients (zinc). There are many many more nutritional hormetins yet to be identified, and synthetic hormetins yet to be synthesized. – Mental hormetins – mental activity (reading, puzzle solving, chess), public speaking/performance, focussed attention (meditation), “falling” in love…. If you are a producer of or thinking of producing a hormetin, you could get it authenticated by my series of criteria for hormetins, and a “CERTIFICATE OF HORMETIN AUTHENTICITY – COHA” will be issued, which can be the basis of the scientific credibility of your product.